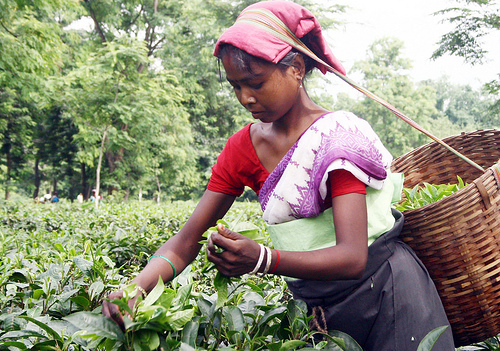 ← Why are there no tea plantations in the US? For centuries the only way to harvest tea leaves was to hand pluck them, and in many countries that is still the primary means of harvest. This may be intentional or may be due to the lack of capital necessary to purchase the equipment. For those farms who chose to use modern agricultural equipment there are multiple options from which to choose that can be implemented at various points in the harvesting season. For example, in Japan, some farmers choose to hand pluck the first flush of a season and use mechanical means for subsequent harvests. Tea does have a harvesting season, though the length and number of flushes varies widely. In China it is typically in the spring and fall. As mentioned in our earlier blog Camellia Sinensis, season is effected by water, location and temperature. During a harvesting season the tea is usually picked once every week to two weeks. In places where harvesting can occur year round, during the peak season, the tea can be picked multiple times during a week. As you can imagine plucking tea by hand is very labor intensive work where typically, the bud and first two leaves are plucked. In regions of China, on top of plucking the tea leaves, the pluckers are hiking up and down mountainous terrain to get to the leaves. In some of the oldest farms, the pluckers are also climbing into the old ungroomed tea trees to pluck. Pluckers will carry some kind of means to collect leaves as they pluck, often a bag or bamboo basket. They will add leaves as they pluck and when full they carry their harvest back to the farm before returning to the fields to keep plucking. In many countries women make up the predominant portion of the plucking workforce. In China, this is driven by the belief that women have just the right touch in plucking leaves, not leaving the tea tree brushed or damaged at the breaking point. This is extremely important for future harvests, because the tea tree will not continue to produce leaves on a branch where it is bruised or damaged. Knowing that the tea tree is sensitive to where the plucking occurs, it is hard to imagine how big farm trackers or automatic pruners could to the same job. 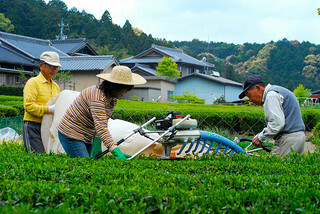 However, the Japanese have implemented laser technology to allow their automatic pruning machines to be hand-pulled over the tea trees with cuttings sucked into either bags or shoots that go back to the main staging area for the plucked tea. This laser guidance allows the pruners to cut at just the right place and angle so the tree continues to grow from the same branch. Since oxidation begins immediately after harvest it is critical, especially for green tea, to start the manufacturing process as soon as possible and this system allows much faster transport of leaves to processing facilities. I imagine that other countries, like Sri Lanka, which are experiencing labor shortages on their tea farms as younger generations leave the farm for jobs in the cities, will eventually turn to this technology to allow harvesting to continue. While many countries still utilize substantial labor to harvest tea, Argentina plantations almost exclusively use large elevated tractors that drive above the tea trees to harvest tea leaves. Machine harvested leaves don’t usually have the bud and two leaf combination but individual leaves instead, some with and some without stems. Given that the plantations in Argentina are able to harvest year round, it is not a surprise that they use equipment. Mechanically harvested tea is not always destined to tea bags. Quality loose leaf tea can be harvested by machine, you will just not see a bud and two leaves in the tea. Instead you will find single leaves and buds and in some cases no stems on the leaves with an almost perfectly straight edge at the base of the leaf. As for whether plucking by hand or machine effects the quality of the end product, it is hard to imagine that it does. Of course, I am just an American that is accustomed to John Deere tractors harvesting everything from oranges to wheat, so why not tea? This entry was posted in Tea Production and tagged Argentina, Black Tea, Camellia sinensis, China, Green tea, Japan, Sri Lanka, Tea, Tea bag. Bookmark the permalink.